Are you sure you have all your bases covered when it comes to your Google Ads? Maybe there are keywords you haven’t thought to target? Maybe you haven’t gotten around to promoting the latest product on your site? Here’s an idea… Let Google fill in some of those gaps for you! Enter Dynamic Search Ads. Dynamic Search Ads are displayed in the Google search engine based on your website’s content. With its web crawling technology, Google automatically targets search terms related to your website and creates an ad with a dynamic Headline, while leaving you the control over the ad description. It’s the perfect ad type to complement your other Google advertising efforts. 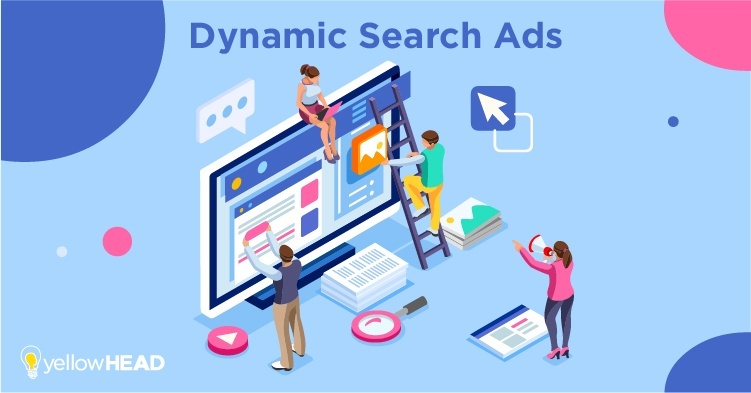 Why should you use Dynamic Search Ads? That being said, DSA campaigns are not for everyone. In order to get the best out of this type of campaign, you will need to have a large website with a lot of content and inventory. This is because the campaign will target users according to their queries and website inventory. Meaning, if someone will type a phrase from your site, the page title or any related terms, your ad will appear containing a relevant Headline and URL. It will thus receive maximum coverage of the site. Even if the account already contains a lot of BMM campaigns (Broad Match Modifier), there is still a chance you are missing some valuable keywords. When creating an ad, you need to insert a description (as you would in a regular search ad); the headline is inserted automatically from the landing page the ad directs users to. You can then check the performance of each headline and description combination and optimize accordingly. Page Feed – This is a “monitored” way to use the campaign. It means that Google will not search the entire website but only a list of pages you uploaded to the AdWords account. With Page Feed, you can avoid spending money on low converting landing pages or non-converting keywords. The down side is that we are limiting the campaign and the opportunity to learn new search term ideas, therefore scaling will be harder to execute. The page feed form contains two columns: the URL and the custom label which describes the URL theme and categorizes the URLs according to your choice. This gives us the option to optimize according to labels – we can narrow the targeting to a few labels from the entire feed and create dedicated ad groups for those labels if we choose. We can decide to exclude lower-performing labels as well. Categories – Your website is split to categories according to Google. For example, if you are selling home products then your categories could be sofas, beds, closets etc. You can choose the categories you want to target and then optimize according to each category. You can also create dedicated ad groups for categories and exclude the lower-performing categories. All webpages – This is the broadest way to use DSA campaigns. The campaign will target all of your website pages with no limitations. It is fit for someone who wants to get a lot of insights within a short period of time. The downside is this process may be expensive and not worthwhile, since it demands a lot of wasted funds until you gather the desired insights. Here at yellowHEAD, we’ve seen great results with Dynamic Search Ads. Below are a couple of examples (brand names excluded for discretion), including our methods for optimizing these campaigns. 1. We opened a Page Feed DSA campaign with 40 pages, which usually is not considered much, but was enough in this specific case since a lot of the landing pages are full of content and the campaign gained traffic easily. We used Max Conversion bid strategy, by which Google sets your bids automatically to gain as many conversions as possible within your budget. The campaign’s CPA was only 33% of the average CPA for campaigns of this account. After a while, we started splitting the campaign into ad groups, creating more targeted ads and improving CVR. Throughout the activity, we kept excluding bad terms and landing pages that did not convert well. The page feed campaign delivered outstanding results and greatly contributed in scaling the account. We checked if keywords appeared in regular search campaigns. If so, we examined where they performed better (according to Google, there is no internal competition; the algorithm chooses where the keyword is most likely to convert). We split the campaign into ad groups (as in the example above). Categories campaign – Since the website contains a lot of non-converting landing pages, we decided not to run on all pages but rather on categories. This served as a discovery campaign from which we could find new search terms to target in future campaigns. This campaign is running on a lower scale than the feed due to a higher CPA. Still, the results are excellent relative to those of other campaigns for this account. We continually check for new keywords – if a particular keyword does not convert well, we try to think of a different allocation for it within another campaign. In conclusion, it is highly recommended to give DSA campaigns a try. Check your account needs and set up a DSA campaign accordingly. You can always go back to using only the original Google search campaigns.